Are you Training For Basketball Contact? If you look at the long history of basketball you find that the sport was originally not intended to have much contact in it even though it was invented as a way for athletes to stay in shape when it was too cold to play football outside. 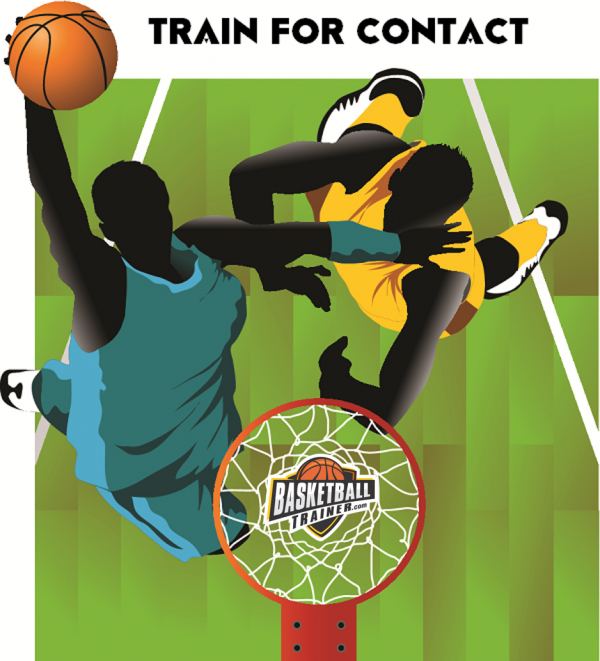 In the general public it is perceived that there isn’t supposed to be much contact in basketball when in reality the higher the competition the more contact is a practiced part of the game taught by coaches and trainers. Fans, parents, and spectators get upset when a player is knocked to the ground or bodied out of the way during game play but the way the game is played now those things are just part of it and you should be prepared for them. Typically players get pushed around in the paint, when finishing at the rim, and by bigger stronger athletes on defense. There are steps to you can take to improve your ability to finish, navigate the paint, and hold your ground on defense. Adding lean flexible muscle, improving balance, and practicing against tough physical players constantly can improve your ability to be a physical force on the floor. First of you need to develop muscle that will improve your strength, explosiveness, and prevent injuries. For basketball players they need to have extremely explosive hips, strong shoulders, and strong backs. Along with strength training basketball players need to eat! Especially since along with trying to grow muscle you are usually training or playing 5 plus days a week burning large amounts of calories. Try to maintain a diet hi in protein and good carbohydrates while staying away from soda, fast food, processed foods (foods that come prepackaged). Second you need to improve balance by strengthening lower body joints (knees & ankles), improving core strength, and master basketball footwork. Single leg exercises and balance exercises will improve knee and ankle strength and prevent injuries. Core strength exercises are easy to find but need to be done every workout. Focus on your footwork needs to be an everyday focus in practice and when working with your skill development coach. Finally playing and practicing against bigger, stronger, and more physical players will teach you to adapt and play through contact. You will begin to learn how to control your body after contact and just get used other players try and bully you. Also playing against bigger stronger athletes will also teach you how to play against better competition. Your body will also naturally adapt and get stronger if you consistently play against more formidable players. Remember all of these things will come over time and they are a continuing process. Just because you lacking body weight, size, or balance right now doesn’t mean those things won’t come and you can’t overcome them now. If you’re smaller learn to use moves to counter defenders trying to bully you and when fouled punish them by making shots and then making free throws. Just look at player like Kevin Durant and Steph Curry they aren’t the most physically imposing players but they are two of the best players in the NBA. This article was a contribution from Denver basketball trainer Erik Buehler.